People need to help each other out more than ever these days, so if we come across anything we think you might find useful, we’ll publish it in this here Ten Year Tags Magazine, which we’ve called: It’s All About The Brass. Let’s start with How to make your own Cigarette Cards. Yes, really. See below. Every time someone orders a Ten Year Tag Dog Name Tag, we politely ask for the breed of dog, or dogs. This is not compulsory, we’re just nosy. 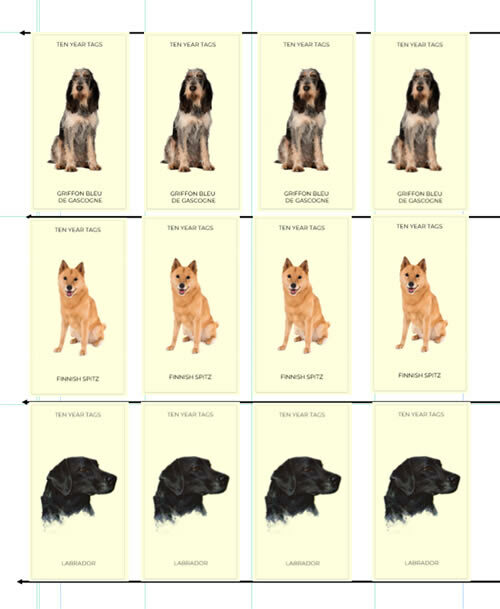 However, when customers DO tell us the breed, we include a cigarette card specific to that breed. You’re probably too young to remember cigarette cards. They were ‘collectibles’, originally introduced to stiffen paper packets of fags, then turned into tiny, but informative works of art that almost made it worth smoking just to collect them. They undoubtedly wouldn’t be allowed now. And rightly so of course. It was Mrs Tagmaster’s idea you know, ‘Madame’ as I call her. We had a set of our own courtesy of my dad, a committed smoker, who is consequently long gone. ‘Let’s include a cigarette card that matches the breed of every dog that orders‘. What a good idea I thought, while gently pointing out that it’s probably not the dog itself that orders (this didn’t go down well). There are 50 in the set, each one painted by Arthur Wardle, a successful British painter, born in 1860, which should give you an idea of just how long ago we’re talking here. It quickly became apparent that there are more than 50 breeds of dog out there. Wait, what’s that? What do you mean Arthur Wardle only painted about 50 breeds of dog? Yes, correct. Just the 50 breeds back then when he painted them, which was circa 1930. In the first few months of Ten Year Tags we had orders for over 150 different breeds. Consequently we had to make our own card each time there was no vintage one. We always write the content on the reverse uniquely too, which means doing a tiny bit of studying about the breed, many of which are completely new to us. This is, of course, a great opportunity to learn about dog breeds we might not have come across. Even by lunchtime today we’d had a Maltipoo, a Sproodle and a Duck Tolling Retriever. Yesterday a Podenco joined the ranks, along with a Treeing Walker Coonhound. Crazy man! I started to make a page for each one, using the text and image that makes the back and front of each cigarette card. Here’s the Brittany Spaniel, just 167 to go. Ah, I’ve managed the Welsh Springer Spaniel as well now. Plus a few more I’ve put under the ‘Dogs of the World’ menu item. Oh I will get round to this in great, step-by-step detail later, we’re a bit busy polishing brass right now. However, let’s make a start. Suffice to say it involves Microsoft Publisher, which I had never used before, but found out it has a sneaky set of double-sided printing techniques that make this a whole lot easier. I had read that accurate double-sided printing was not possible with a simple inkjet printer (mine is a Canon something or other that was less than £40 from Argos). Anyway reading ‘you cannot print double-sided accurately‘ in many places online struck me as nonsense. Starting practicing on A4 paper, the first thing needed was a cigarette card template for the front and, importantly, one for the reverse. Being a bit old-school, I still use Fireworks (refusing to call it Adobe Fireworks) and Abobe Illustrator as well, but to a lesser degree. I am definitely no designer of any sort. If I can do this, YOU can. The painter of our original, painted dog cigarette cards, Arthur Wardle, painted many animals throughout his life. Not just dogs. Not just cigarette cards either. 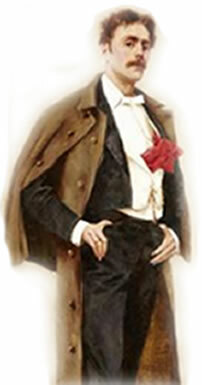 He had a painting in a Royal Acedemy exhibition when he was just 16, in 1876. Microsoft Publisher – Should be included with your version of Microsoft Office you know. A printer – I have a super-expensive HP Printer that will NOT print on thick card ()we will get to the card in a minute, hang on there) and a sub-£40 Cannon printer (Ink Jet) that prints on 290GSM card day in and day out with out batting an eyelid. Card – I told you we’d get to this. While practicing on paper is fine for starters, you will need card. Madame tried to get me to economize with a thinner, cheaper card, I didn’t like the way it felt and found some 290GSM card at a sensible price. Photos of Dogs – this is not compulsory. 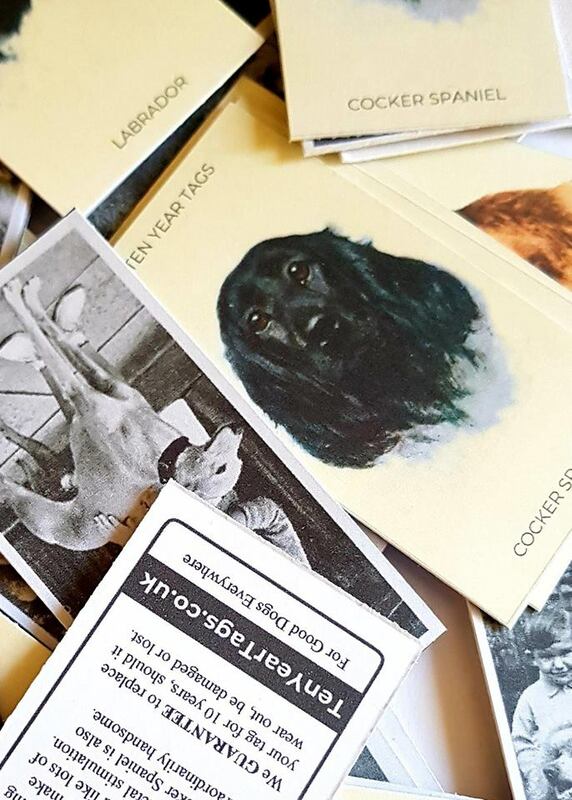 You might not want photos of dogs on your cigarette cards. However, we did and successfully used 123rf.com (a picture library, of which there are many) for most of ours, paying a few £ for each one. For the Arthur Wardle ones and ‘Dogs of the World’ old photos (another range of dog cigarette cards) we found photographing the cards produced better results than scanning them. Adobe Fireworks or Illustrator or Equivalent – None of these are critical, Microsoft Publisher does seem to be, but you can use any way of editing graphics and images you’re familiar with already. Correctly-attributed artwork, especially where this was Arthur Wardle, or one of the Dogs of the World photographs. Every card carries details of our Ten Year Tags Guarantee and points people at this Website to refer to the Terms & Conditions. EVERY dog is the best dog in the world. You knew that didn’t you? Good. EVERY dog is extraordinarily handsome. No surprises there. EVERY dog needs lots of exercise and mental stimulation. The photos, let’s try and keep to the spirit of the original cards and have a consistent style. 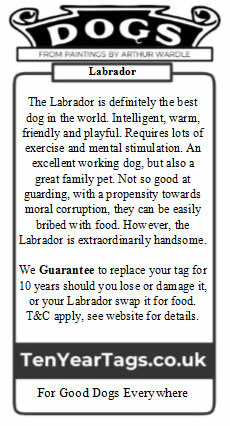 Again, harder to achieve in practice, especially when it’s a super-rare dog that’s hard to find ANY photo of at all. A couple of rare breeds indeed here, The Finnish Spitz (middle row) and Griffon Bleu De Gascogne(top row) with a fluffy old labrador thrown in for good measure. As you can see, it’s hardly a big word count, not SUCH a demanding job! For good dogs everywhere – ALL dogs are good dogs of course. 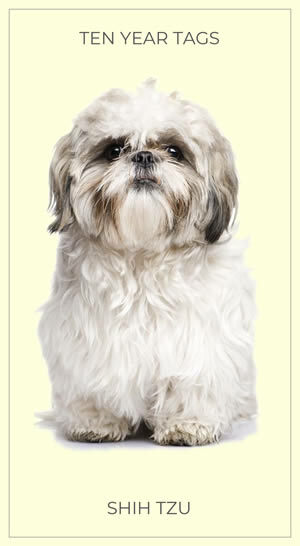 Look at this little Shih Tzu. We keep the colour of the background thus so it comes out looking old. It sort-of works and is consistent across all the cards at least. Haven’t finished, more to come. Let me know …if you’re interested!